I have to admit, sometimes I’m a sucker for daily deals. I’m still receiving numerous emails a day encouraging me to spend more money than I already do. This time, a friend of mine was intrigued by a deal from Hapa Umi. $22.50 per person for a 3-course dinner, a reasonable price. So we went for it. The restaurant doesn’t offer a 3-course menu on a regular basis. Therefore a special 3-course dinner was put together for buyers of this deal. We had a choice of 3 items each for both appy and entree, and for dessert, we just chose from the regular dessert menu. In order to maximize the number of dishes that we could try, my friend and I ordered different dishes for each course. For appetizer, I picked Beef Tataki. When it arrived I saw 9 slices of beef sitting prettily on a plate, topped with garnish and sauce. Personally I think the slices were too thick, which made the meat a bit chewy. The green onion oil reminds me of the green onion/ginger oil that Chinese people dip their steamed chicken with. In fact, it tasted just like the one my mom makes at home. Along with the ponzu sauce, the green onion oil brought out the essence of the beef. 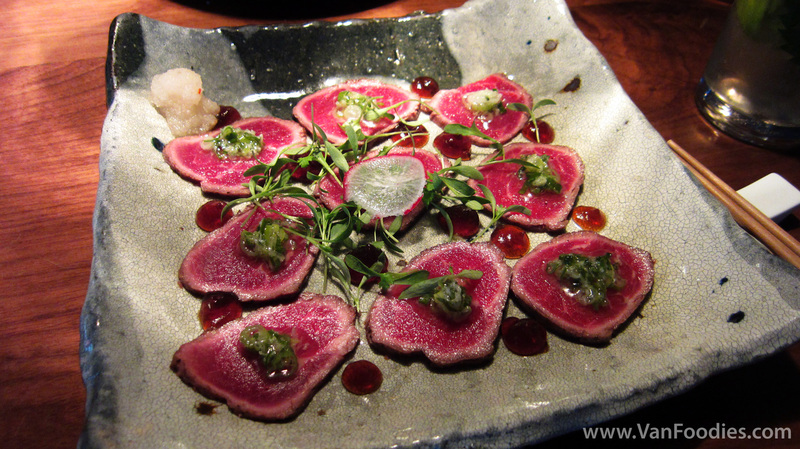 It isn’t like any beef tataki that I’ve had in the past, but the flavour was pretty good. My friend chose Tempura Oysters. The batter wasn’t your typical tempura batter, but more like the agedashi tofu batter. Each oyster was halved, then battered and fried. There were about 8 pieces, so 4 oysters in total. The outside was a bit gooey, but inside the oyster was rather moist and not fishy at all. Because they were deep fried, I can’t exactly tell whether they were Fanny Bay or other species. However they were of decent size, and the sauce worked quite well with the oysters, so we were happy with the dish. Naturally the two of us selected the meat dishes as our entrees. My BC Wild Salmon was so different from what you would get at a west coast seafood restaurant. Instead of a big piece of filet, it was skewers of salmon strips grilled with a soy-maple marinate. In my opinion, the marinate was a bit too weak, or the fish wasn’t the freshest, because I could taste a slight hint of fishiness in the salmon. Having said that, the shallot butter on top did help with the seasoning and overall it was a good dish. I like all the little pieces of grilled vegetables. The portion was on the small side; it wasn’t very filling. I have always avoided ordering a chicken breast dish because I’m not a fan of dry white meat. Thanks to my friend for ordering it – way to take one for the team! But this Chicken Breast came as a surprise to me. Because it’s cooked sous-vide, it was super moist, so moist that I almost thought it was fake breast meat. Wait, soy glaze? Didn’t the salmon use soy as part of the marinate? Soy sauce is a widely used marinate and seasoning in Asian cuisine, but I’m sure there are more ways to marinate salmon and chicken than soy sauce. But then, it tasted good, despite its one dimensional flavour, so one can’t really complain. 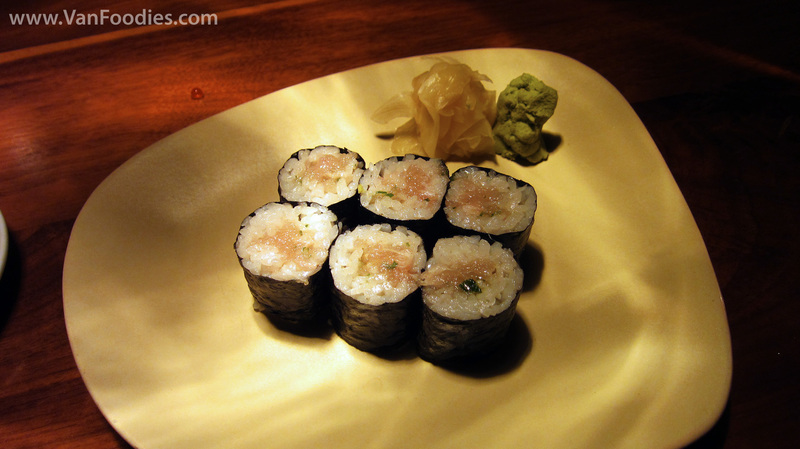 Because of the small portion size, my friend ended up ordering a Negitoro roll on the side. It’s one of the cheapest items on the menu, something more reasonably priced. She said it’s a very good Negitoro roll. I’d like to claim that I had pretty good self control, so I didn’t have any of the roll to over stuff myself! Lastly, I was most intrigued by its dessert menu. For one, there were more options so I was really choosing between 3 or 4 desserts that caught my eyes. 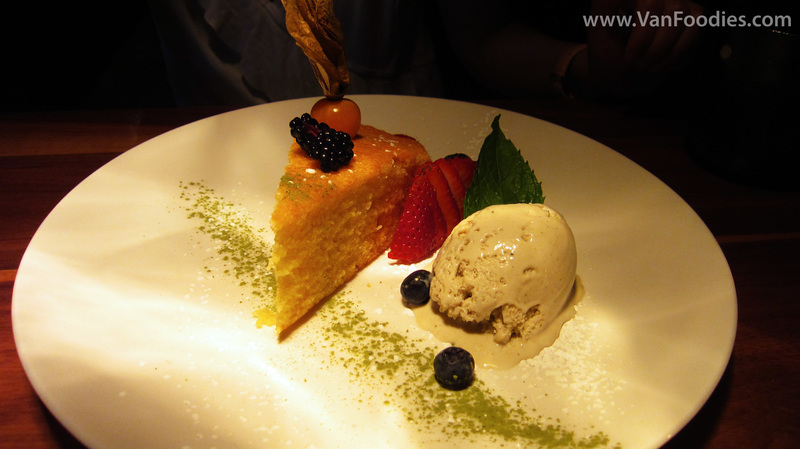 None of the desserts was traditional Japanese dessert; rather, they were common desserts with a Japanese twist. I selected Yuzu Tart, which essentially was a lemon tart. It was citrusy and tasted no different from a regular lemon tart. The accompanying blackberry sorbet was tart (hahaha), not very sweet, so it wasn’t really balancing the citrus in the yuzu tart. My friend ended her meal with the Polenta Cake. Polenta, something you usually find in an entree as a substitute to potatoes, was used in this cake recipe. It made the cake rather coarse in texture, but moist. It got a little crumbly as you dig your fork into it. On the other hand, the sencha ice cream was quite good. It’s better than regular green tea ice cream, in my opinion, as sencha uses roasted green tea leaves, so there’s some nutty flavour in the ice cream. Given the enormous size of the dining room, I think the servers did a good job keeping an eye on each table. Overall our server was quite attentive and she’s mostly available when we needed her. 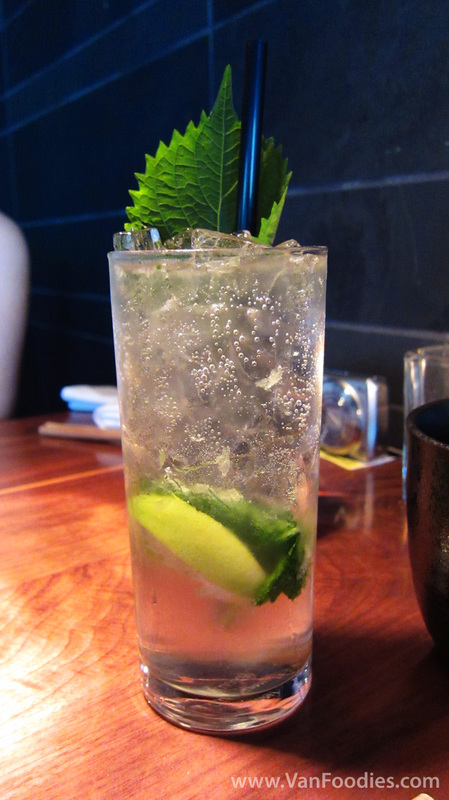 I was a bit disappointed in my Shiso Mojito, though, as it was a water-down version of a soda water drink. I didn’t order a virgin mojito. I just couldn’t taste the rum, or plum wine, or even just the mint/shiso leaves. My friend, who doesn’t drink, agreed. I have to make a note about its pricing here. With the price we paid, it was not a bad deal. I did check out the regular menu and look up the regular price of most of our dishes. Each of our meal (3 courses combined) would’ve cost us around $40 per person, so we did save some money there. At the end I didn’t feel stuffed, neither did I feel hungry shortly after dinner. But that’s for a girl my size. Imagine a guy having our meal, he wouldn’t be too satisfied with the portion size, especially if he were to pay at regular price. Also, I was speculating that our dinner was actually valued at less than what was advertised on the deal ($46 per person), but it’s hard for us to judge since this menu is not offered on a regular basis so technically we are not comparing apple to apple here. Giving it the benefit of the doubt, our dishes could be of a bigger portion, or had more (expensive) ingredients/flare than the regular item. Judging purely on food quality, I think the restaurant is worth a re-visit. 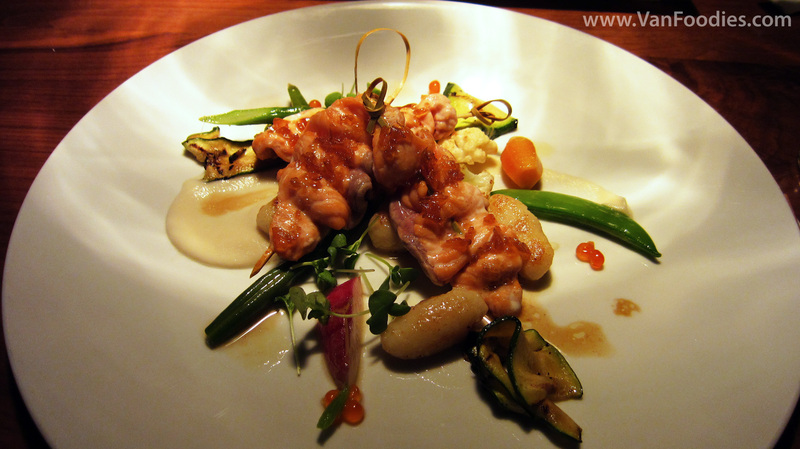 However, its regular menu suggests that its food is quite over-priced. I’m not big on fusion cuisines anyway, so I probably won’t return unless it offers another great deal. 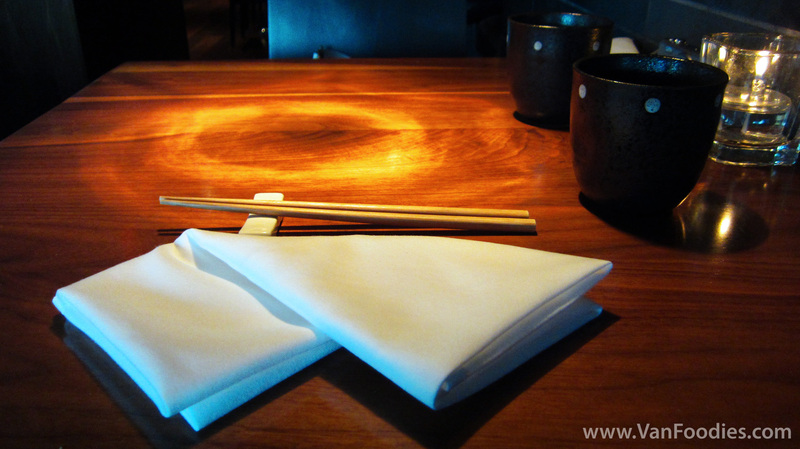 There are many good Japanese restaurants in Vancouver, so to stay competitive not only do you need to offer good food, but also a good price.